125-175w Brushless Motor, 20A Electronics Speed Control (ESC) and 2 Cell 1500mAh LiPo Battery. VMAX Electric Power Pack #VMA-111EPPVM recommended. Engine (Glow - 2 Stroke): .06-.15 cu in. ENYA .09TV recommended. Use ENYA 15TV for high performance. Radio: 4 ch with 4 micro servos plus Electronic Speed Control (ESC) for Electric. Add one extra micro servo for steerable nose gear. Add one extra micro servo for Glow Engine throttle control. Use computer radio for flaperons. The VMAR AERO SUBARU 06-15 ARF ECS is officially semi-scale but when you see the detailing you will think it's a miniature version of the real thing! 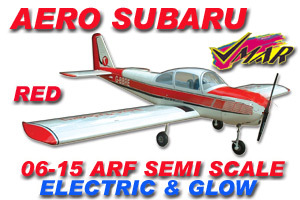 Intended for either Electric or Glow Power the VMAR AERO SUBARU 06-15 ARF ECS has a flying weight of 23oz or less when equipped with micro servos. Perfect for a .09 Enya or similar glow engine or a 125-175w brushless motor. With a semi-symmetrical wing wing, mild dihedral and light wing loading the VMAR AERO SUBARU 06-15 ARF ECS is quick to assemble and easy to fly! Simple to transport and perfect for small fields. When equipped with a 1500 mAh 2cell LiPo battery and a brushless motor the VMAR AERO SUBARU 06-15 ARF ECS can fly for 30 minutes or more! The new VMAR AERO SUBARU 06-15 ARF ECS is built using select light weight balsa, lite ply and other structural woods... no foam! 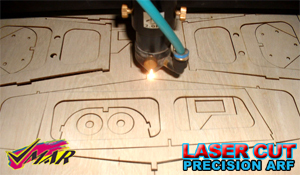 To ensure that strength and precision is maximized, over 90% of the AERO SUBARU 06-15 is factory built using LASER CUT components... Truly a PRECISION ARF! Best of all the VMAR AERO SUBARU 06-15 utilizes the revolutionary Ultratough POLYCOTE ECS Enhanced Covering System. The new VMAR AERO SUBARU 06-15 ARF ECS utilizes POLYCOTE ECS to ensure that you have the best in covering and that the detailed graphics stays looking as good as new for the life of the model! For more information please click on the POLYCOTE ECS Logo below. POLYCOTE ECS... Only from VMAR Manufacturing! Affordable RC Products... Engineered by Modellers... for Modellers! In addition to using POLYCOTE ECS, nothing even comes close to the incredible attention to detail, completeness and quality provided by VMAR. All Wood Built Up Construction! Extensive use of Light Weight Balsa and Lite Ply! POLYCOTE ECS Enhanced Graphics System! All Graphics is inside the Covering! Semi Symmetrical Wing with Mild Dihedral for easy to fly stability! Very Complete High Quality Hardware Pack! This is a hot item! Get your order in today! Dual Power Module firewalls for both Electric or Glow Power installation!